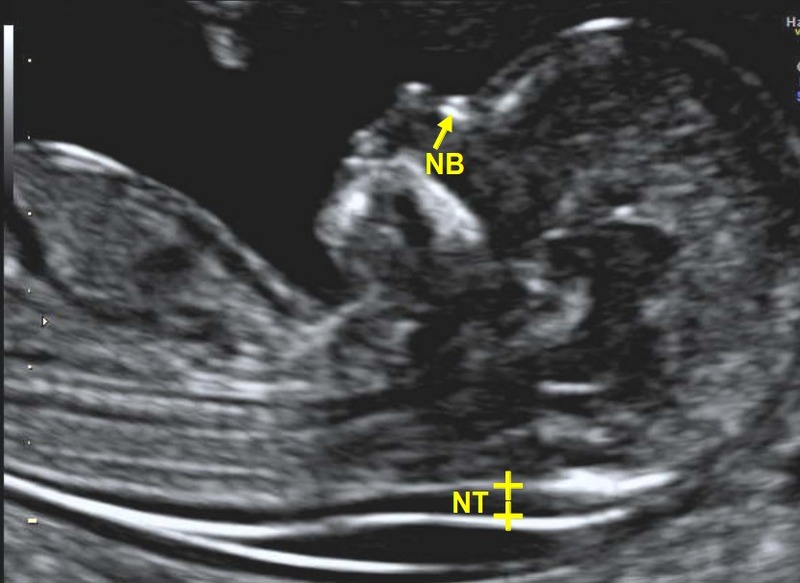 Nuchal translucency (NT) is the sonographic appearance of a collection of fluid under the skin behind the fetal neck in the first-trimester of pregnancy. The term translucency is used, irrespective of whether it is septated or not and whether it is confined to the neck or envelopes the whole fetus. In fetuses with chromosomal abnormalities, cardiac defects and many genetic syndromes the NT thickness is increased. Screening by NT can detect about 80% of fetuses with trisomy 21 and other major aneuploides for a false positive rate of 5%. The combination of NT and maternal serum free β-hCG and PAPP-A improves the detection to 90%. There is now evidence that the detection rate can increase to about 95% and the false positive rate can be reduced to 3% by also examining the nasal bone, ductus venosus flow and tricuspid flow. Carrying out the ultrasound examination by appropriately trained sonographers. Measurement of maternal serum free β-hCG and PAPP-A by laboratories that can demonstrate good quality assurance performance. A risk calculation program that uses an algorithm based on scientific evidence. The software companies that use this algorithm are Astraia Software GmbH, ViewPoint GE Healthcare and Zeitgeist Health SE. Appropriate counselling of the parents. Sonographers who have obtained the FMF Certificate in the nuchal translucency (NT) scan can obtain free of charge the FMF software for first-trimester screening for chromosomal abnormalities by maternal age, fetal NT thickness and maternal serum free β-hCG and PAPP-A. Should they wish to use the additional markers for chromosomal abnormalities (nasal bone, tricuspid flow and ductus venosus flow) they would need to obtain the appropriate FMF Certificate for each of these markers. Submission of a logbook of 3 images demonstrating the measurement of NT. The fetal crown-rump length should be between 45 and 84mm. The magnification of the image should be such that the fetal head and thorax occupy the whole screen. The fetus should be in a neutral position, with the head in line with the spine. When the fetal neck is hyperextended the measurement can be falsely increased and when the neck is flexed, the measurement can be falsely decreased. Care must be taken to distinguish between fetal skin and amnion. The widest part of translucency must always be measured. Measurements should be taken with the inner border of the horizontal line of the callipers placed ON the line that defines the nuchal translucency thickness - the crossbar of the calliper should be such that it is hardly visible as it merges with the white line of the border, not in the nuchal fluid. In magnifying the image (pre or post freeze zoom) it is important to turn the gain down. This avoids the mistake of placing the calliper on the fuzzy edge of the line which causes an underestimate of the nuchal measurement. During the scan more than one measurement must be taken and the maximum one that meets all the above criteria should be recorded in the database. 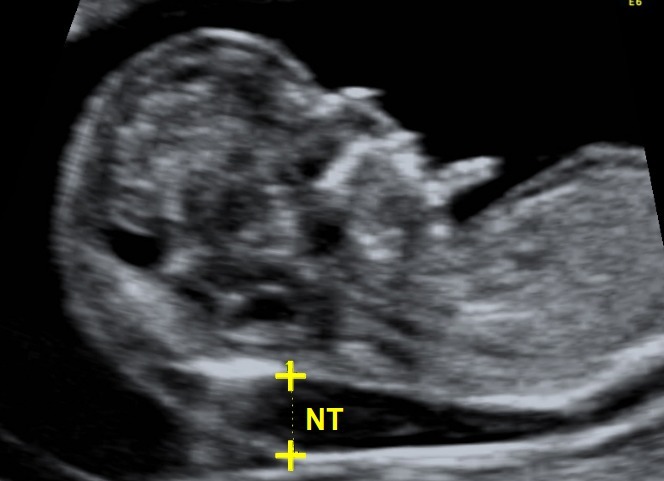 Each sonographer must submit NT data and 3 images for audit 12 months after obtaining the FMF Certificate of competence in NT and the FMF software for the calculation of risks. In addition to the FMF audit, all sonographers are encouraged to perform their own internal quality assurance on a monthly basis by examining their NT distribution using the automated audit module incorporated within the FMF risk calculation software. The audit involves assessment of the distribution of NT measurements of each sonographer and examination of their images. Sonographers passing their audit will be re-audited and re-licensed on an annual basis thereafter. The NT distribution cannot be assessed if fewer than 30 scans have been performed, but in this situation an individual can still pass their audit if their images are satisfactory. If the NT distribution falls outside the satisfactory range advice will be given on how to improve the NT technique, based on the review of images. The name of the sonographer will be removed from the FMF website list of holders of the Certificate of competence in NT. A new audit will be carried out in 3 months (please see audit policies on your own FMF page) and the sonographer will only be reinstated on the FMF website list once the audit is considered satisfactory. However, if in the new audit the standard of the sonographer has not improved then their FMF software license will be revoked. In such case the sonographer will need to be retrained and apply for recertification by attending the FMF internet based course on the 11-13 weeks scan and submitting the appropriate logbook of images. To view the list of sonographers who have obtained the certificate of competence in measurement of nuchal translucency please click here. To view the list of sonographers, who in addition to obtaining the certificate of competence in measurement of NT, have provided satisfactory results for audit, please click here. The FMF calculator for estimation of risk for trisomies is available here.